The fact that these comments were made by the island’s Minister of Education, who also happens to be the lone female cabinet member and parliamentary representative, is bad enough. However considering that St. Vincent is also the femicide capital of the Eastern Caribbean makes Miguel's lack of sensitivity and insight all the more inexcusable. In the first three weeks of 2012 alone, St. Vincent—a country with a population of roughly 120,000—tragically lost three women to domestic violence. This crisis is not new. In 2007 St. Vincent had the third-highest rate of reported rapes in the world, according to a United Nations Office on Drugs and Crime report. Even the current Prime Minister Ralph Gonsalves has been accused of sexual assault, once by a policewoman and once by a Toronto lawyer. Both charges have since been withdrawn, but not without controversy. Recently released WikiLeaks reports have highlighted that Gonsalves offered $185,000 for the policewoman to drop the charges. Instances such as the accusations against the Prime Minister reveal that domestic violence has long been a problem in St. Vincent - like many other Caribbean islands. That said, it is important to recognize and understand the far reaching impact that neoliberalism's recent economic transformations of the countryside has had on Caribbean families, and why such incidents of domestic violence are on the rise. In 2011, the World Trade Organization was finally successful in its 15-year effort to terminate the Eastern Caribbean’s protected agricultural trade with Europe. The shift has had terrible consequences for the region's agricultural industry. The protection enjoyed by the small family farmers in the Caribbean was portrayed as a threat to the entire order of free trade and to the profit margins of large American multinationals like Chiquita. This loss of livelihood for tens of thousands of farmers has had a dramatic impact on traditional family dynamics, as the increased pressures and uncertainties has led to a spike in domestic violence. Newspaper headlines across the Caribbean regularly highlight deaths or graphic mutilations as a result of a “familial quarrel.” Many more incidents of abuse are not reported at all. Too often we do not consider the link between economic collapse or crisis and a rise in domestic violence. This is not uniquely confined to the Caribbean, it is something that is commonly seen throughout North America and Europe as well. The collapse of the Caribbean economies, especially the agricultural industry, and how this has fuelled the drug trade has been the topic of study for many, but the increase in domestic violence had not been adequately explored. Men who lose their position as the traditional breadwinners in the family often face what is called a “crisis of masculinity.” Unable to provide for their families due to rising unemployment, they unfortunately often resort to violence to re-establish their dominance and control upon their families. Such theories have contributed significantly to the general understanding of domestic violence in industrialized countries, but have yet to be applied to the Caribbean on a wider scale. This is not to say that anti-domestic violence initiatives have not taken place in the Caribbean. In 2003, Grenada established a special domestic violence unit, consisting of community outreach programs, counselling, and educational efforts to stem the rising incidence of violence in both households and communities. St. Lucia has established similar measures, creating a women’s support center and a 24-hour hotline which offers counselling. It has also strengthened court protection orders, but domestic violence islandwide is still through the roof. 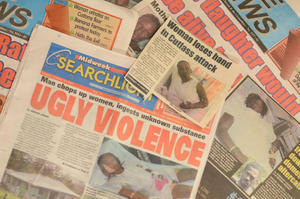 In St. Lucia, the national newspaper The Voice reported in 2010 that domestic violence was now a primary cause of murders on the island. The first step to tackling the issue of domestic violence is to acknowledge the seriousness of the problem and give it the proper context. In other words, erasing the mentality that domestic violence is something that women bring upon themselves for not dressing right or doing “the right things.” Domestic violence should not be just a women’s issue. It affects entire communities and nations, the roots of which are societal in nature, and often triggered by economic crisis and uncertainty. The way to move forward in tackling the issue of domestic violence is to examine it holistically, looking not only at the victims, but at the triggers as well. Judging by the comments of Girlyn Miguel, it appears there is still a long way to go before the conversation is discussed in the serious manner it deserves. Kevin Edmonds is a new NACLA blogger focusing on the Caribbean. For more from his blog, "The Other Side of Paradise," visit nacla.org/blog/other-side-paradise. Edmonds is a former NACLA research associate and a current PhD student at the University of Toronto, where he is studying the impact of neoliberalism on the St. Lucian banana trade. See also the July/August 2010 NACLA Report, "Fault Lines: Perspectives on Haiti's Earthquake."